Lying on a bed of nails, walking barefoot on broken glass - these practices are very old. Yogis lie on beds of nails as part of their religious tradition. They also sleep on thorns and shards of glass. Physically, the benefits of walking and lying on glass or nails include relaxation and stimulation. Magicians sometimes perform such demonstrations as part of their shows. How can you lie on a bed of nails and not be injured? The secret to this phenomenon has a scientific explanation. Consider... If you step on a single nail, Ouch! It will pierce your skin. Your whole body weight is concentrated on one nail-point - thus there is extreme pressure, a puncture wound, and pain. 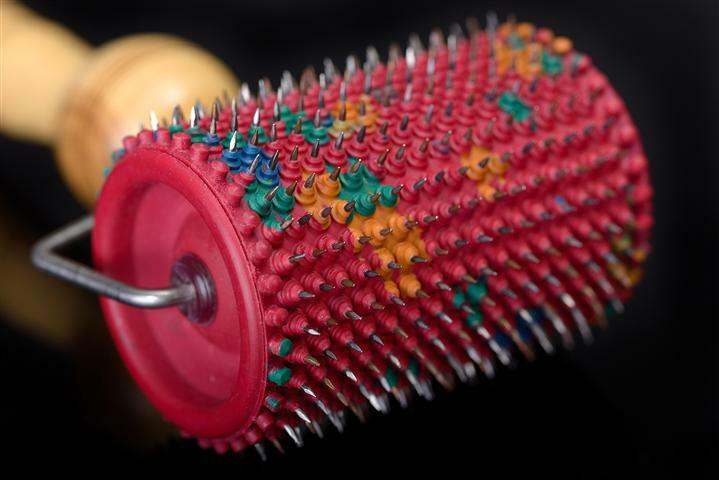 But now, a “bed” of nails...Now, your body's weight is distributed over dozens or hundreds of nails. The force you've put on each individual nail is drastically reduced. Hence... no injury. In fact, lying on a bed of nails produces a very invigorating effect. It's not magic, it's physics! The “RejuvaRoll” stimulates surface blood flow using a series of small pins in a rolling action. You roll it against your facial skin in any direction that seems comfortable. Do the same for your scalp. (many notice increased hair growth.) Actually you can use this device for any area of your body to reduce pain and increase the healing effect of good blood circulation. The deeper the needles penetrate, the more stimulation you receive. I always had a problem with hair loss, many years ago, probably around 15 years ago I met Tonaya when she was touring in my city and bought this. My hair loss stopped, well last year it was time to finally replace the roller (and it would have lasted longer I did not take the best care of it, would throw it in suitcases, etc) and my hair started to fall out again. I placed my order for it last week, and I got in in a week, and I live in Canada!!!!!!. Outstanding customer service, clearly they ship out products right away. Just used it for 5 mins and my scalp tingling so already it is working. Love this product. Use RejuvaRoll as often as your skin permits, ideally every day. It will leave the skin instantly brighter and clearer - looking. If RejuvaRoll gets wet or soiled, clean using liquid bath soap, and when finished blow dry it. RejuvaRoll uses two types of needles - copper and iron. Some of the iron needles are plated with zinc. Some copper needles are plated in silver. As a result, four different metals come into contact with your skin. As we all know, blood is among the most important fluids in the human body. Metals in micro-doses are part of your blood's makeup. Trace elements - including these metals - are vital for our well being. The beneficial effect of the “RejuvaRoll” begins when the tips of the RejuvaRoll's needles are differently charged, producing galvanic current at the contact points on the skin. RejuvaRoll's measurements: The cylinder is 1 2/3 inches in diameter and is 2 2/3 inches long. In addition, blood rushes to your skin's surface, repairing and rejuvenating your skin, resolving certain skin problems and stimulating cells with a minuscule current. If these metals are missing from the body, and from the skin cells in particular, they will absorb through the skin. It is especially good for stimulating hair growth when applied on your scalp. Using the “RejuvaRoll” causes electrophoresis of metals to take place, and the body assimilates the missing microelements. The term electrophoresis describes the migration of charged particles in an electric field. Electro refers to the energy of electricity. Phoresis, from the Greek phoros, means "to carry across." Thus electrophoresis is the process in which molecules are forced across skin, moved by an electrical current. The needle tips act as electrodes. During contact with the needle tips, this galvanic current passes through to the deeper skin layers, where biochemical reactions take place. Our RejuvaRoll is based on an original, patented design, and that design has been in use for more than 15 years. It’s won numerous awards and undergone rigorous medical testing. The other, loosely similar devices you’ll see here and there came later. They’re imitations, with minor changes manufacturers have used, as the basis for claiming novelty. On the internet, you can fine the statements like: “greater [than .75] mm would be painful and induce scarring from punctures.” Whoever wrote that doesn’t have a clear grasp of the facts. Safety does not depend on pin length, but on how close together the pins are placed. Needles of nearly any length or diameter can penetrate the skin if they’re placed far enough apart. Our RejuvaRoll has pins of 2 mm and is totally safe. The pins will NOT penetrate the skin. Why? Because they are positioned very close together. There are 490 of them! Compare to the Derma Roller, which has only 192. RejuvaRoll is superior to all other rollers on the market, because the pins are made from different metals and provide electrophoresis, offering additional benefits for the skin. You’ll find more information here: RejuvaRoll vs. Derma Roller. 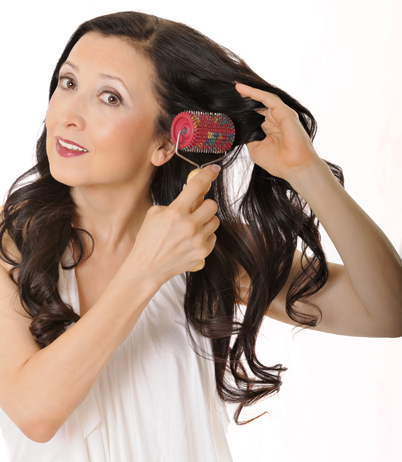 You can use RejuvaRoll not only on your face and scalp, but on any other part of your body. RejuvaRoll promotes healing and releases pain. In 1971, New York Times columnist James Reston visited China and there personally witnessed surgical operations in which acupuncture was the only anesthetic. RejuvaRoll works in a much similar way. All you have to do is to roll the roller along an aching area and the pain often leaves within minutes. Use your RejuvaRoll gently, evenly, smoothly. You'll feel no scratching or gouging - only a calming, soothing effect. As long as you roll along the surface, the pins touch your skin but never pierce it. Blood comes closer to your skin but never contacts the needles. RejuvaRoll is completely noninvasive - there is absolutely no possibility of blood-related infection. I carry my RejuvaRoll with me all the time - at home and on the road. When I have an extra minute, I take it out and use it on my face. Your RejuvaRoll will give you a young girl's rosy cheeks. I'm so sure you'll be delighted that I'll give you 100% guarantee. Use RejuvaRoll daily for one month. If for any reason you're not satisfied with the results, I'll give you full refund minus shipping and handling, no questions asked! Try RejuvaRoll - I know you'll love it! Thank you for your visit with us in San Diego. I thoroughly enjoyed hearing you speak. I love your enthusiasm and the vigor with which you tell your stories—especially the husband at the frozen food section at Costco. I bought everything you were selling and I’m very happy with all my new toys so far. 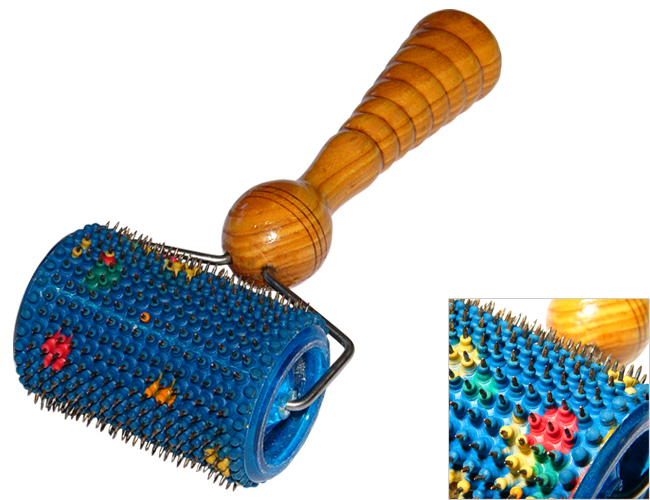 By the way, here is a thought for busy people: I’ve been using the [RejuvaRoll] roller (Rolling Bed of Pins) on my head, face and neck and wearing the belt [Belt of Pins]on my abdomen every day in my car—no excuses about time. I look forward to seeing you next year and relaying my progress to you with my quantum eating.